Usually the bottom cell of a column is called footer. Its purpose is to display some additional information that applies to the whole column. 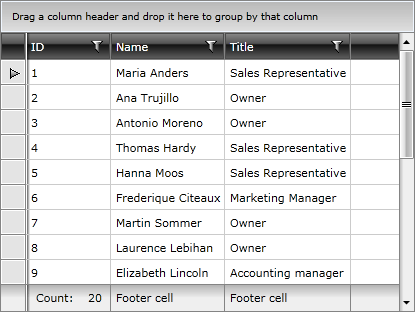 To set the value of the footer use Footer property of the column. Because it is of type object, you are not limited to just using plain text. For example, you can add a corresponding picture to the footer text. 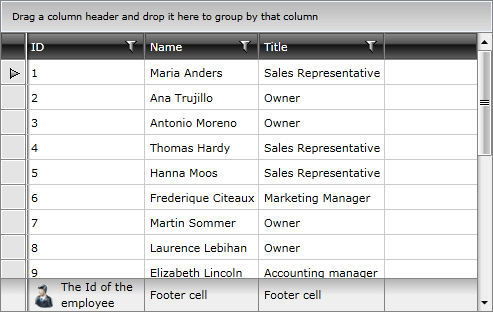 <TextBlock Text="The Id of the employee"
By default column footers are hidden, so in order to make them visible you have to set the ShowColumnFooters property to True. 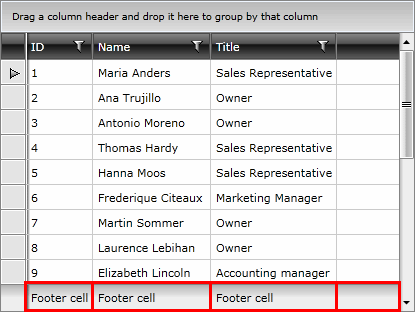 Column footers are also used to display aggregated information on the data displayed in the column via aggregate functions. To learn how to do that take a look at the Aggregate Functions topic.